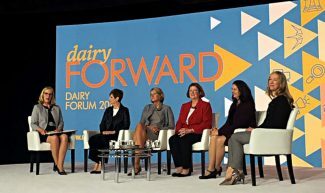 From left, Cary Frye of the International Dairy Foods Association, Miriam Erickson Brown of Anderson Erickson Dairy Company, Beth Ford of Land O'Lakes, Barbara Glenn of the National Association of State Departments of Agriculture, Marilyn Hershey of AR-Joy Farms LLC and Patricia Stroup of Nestle discuss “Women Leading Forward” at the Dairy Forum held this week in Orlando, Fla.
ORLANDO, Fla. — The International Dairy Foods Association will start a group for women in the dairy industry, Cary Frye, the senior vice president for regulatory affairs announced here last week during a Dairy Forum session entitled "Women Leading Forward." 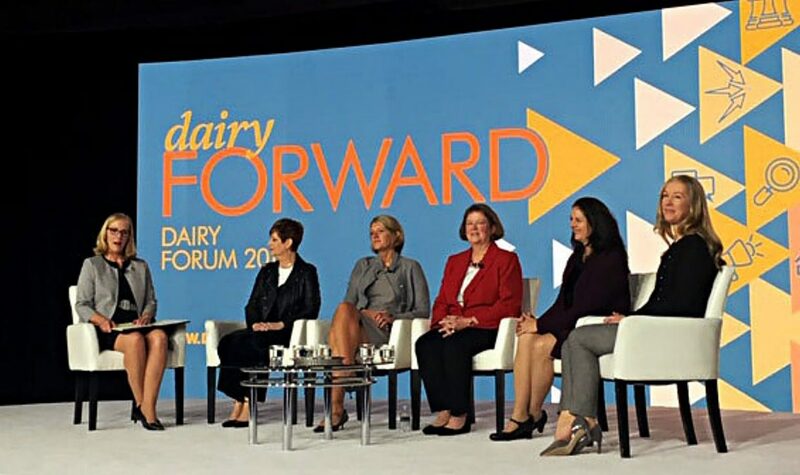 Leadership in the dairy industry is overwhelmingly composed of men, but a panel of women who have become leaders in agriculture explained some of the obstacles they have overcome. Miriam Erickson Brown, president and CEO of Des Moines-based Anderson Erickson Dairy Company, which was founded by her grandfather in 1930, said that only recently she was asked if she is her father's secretary. But Brown said she has persevered because she believes "Packaging up dairy products is like packaging up joy." Beth Ford, president and CEO of Minnesota-based Land O'Lakes, noted she has worked in six industries, and while she was in the oil business where it was "me and 200 dudes," she once had to tell a man to bring his teeth to work. Leadership, she said, is "human interaction, part of life's journey." Barbara Glenn, CEO of the National Association of State Departments of Agriculture, said she is from Nebraska, is a dairy cattle nutritionist by training, and spent 17 years as career scientist working on lactating cows. Glenn said she moved beyond science by becoming the leader of a federation of scientists and began speaking out on behalf of agriculture. "I never thought of things as a hurdle," she said. "I thought I was going to succeed." Marilyn Hershey is owner and operator of of Ar-Joy Farms LLC in Cochranville, Pa., which was started by her husband's parents in 1965. Her first role in dairy was as a dairy princess, she said, but then served on the board of a national dairy organization and is now in her second year as chair of Dairy Management Inc., which oversees the industry's checkoff dollars. Patricia Stroup, the global vice president and head of commodities for Nestlé, based in Switzerland, noted that she started out as a dairy farmer, but decided she was too extroverted to spend her life with dairy cows. She worked at Hillmark Cheese and got a master's degree in business, then went to work for Nestlé 12 years ago in procurement. Stroup said women too often say they can't be mobile because they can't uproot their families. "If you want to advance with Nestlé you have to be mobile," Stroup said, advising women, "Take your family with you."